It’s been a rough year for Facebook. Did you happen to see the recent headline from the New York Times? Facebook is considered to be the leader of the social media pack. It changed the way people looked at, well…each other. It represented a new sense of community and connection. Users shared their wedding photos, gushed about their personal aspirations, even revealed major secrets about themselves and who they were…all under the auspices of privacy…thinking that this was a closed and guarded community. As time has gone on, scandals started rocking the behemoth social media platform. This includes not only the recent breach but questions about foreign intrusion by hackers, analytics firms…even the Russian government. Couple this with conniving automated bots, news feeds infested with “fake news”, etc., and Facebook isn’t exactly the picture of a secure online fortress any longer. Ultimately, all of this has helped shape our current online environment. In a word, it’s about “trust”…or lack thereof. People no longer trust Facebook with their personal information and data. If you’re marketing on Facebook, STOP. However, they still use the Internet as their first stop when vetting service providers, such as who they’ll turn to for dental services, particularly Google, which is now the most trusted media on the planet, according to the Edelman Trust Barometer, a prominent data aggregator. That’s why it’s absolutely critical to your business and bottom line that you learn how to establish the online perception, or as I call it “Your Practice’s Google House” that you are trustworthy and well-liked in your community. Do me a favor, look at the TOP earning dentists in your city, and ask yourself….”How do they look on Google?”. 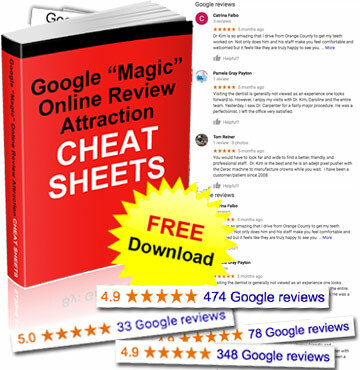 I guarantee that they have hundreds of fresh google reviews, Youtube videos from their best patients bragging about them, a branded Google My Business page and consistent and fresh content all over the web month in and month out. (NOT ON THEIR WEBSITE!). They have a Google marketing system! It’s a fact, that you need to get off the sidelines and get your practice in the game ASAP, because it’s not about your website or some other outdated marketing strategy, like “word of mouth” or print ads. When you are branded like an expert, you have less fee resistance, high rates of case acceptance and the rate of referral automatically increases! (without lifting a finger or saying one salesy word). I’m talking about building “internet assets”…that will add value for decades until you retire or sell your practice! And there’s no better way to do this than through dozens or even hundreds of glowing, five-star Google Reviews, a branded Google business page, Youtube videos from your best patients bragging about you, fresh blog content, so now you show up and LOOK THE PART! Google is now the most trusted media on the planet. * The company has created a process, among its multitude of services, that provides users with fair, unbiased and up-to-the-minute information on virtually everything in their lives. Therefore, people have learned to trust it for nearly everything in their lives. And trust me…your prospective patients and EVEN referrals are using that platform, looking for a dental provider and vetting you in particular. They’re poring through reviews and ratings, evaluating the top-rated dentists in your community. And unless you’re at the top of the list with your patients’ gushing over how great you are, that trust will NOT be established…and your potential patient will be lost to another provider who has done a better job of personifying that level of trust. If you do it correctly, gathering 5-star patient reviews on Google is actually relatively simple. But it’s also easy to do it WRONG. That’s when you start getting bad reviews. You can’t undo the damage, as Google rarely removes negative reviews, This affects your practice and name for years. It’s another reason why you have to follow a system — you can’t and shouldn’t ask every patient for a review. I want to help you put an action plan together to get your practice moving in the right direction, so you can begin to attract better patients, who pay, stay and refer. Do NOT be a stick in the mud, who refuses to change. This year can be that year for change. Let’s do it! Category Blog, General Business, More Google Reviews | Tag business practices, dental business, Dental Marketing, Dental Practice Marketing, get more patients, Google Local Search | Bookmark the permalink.